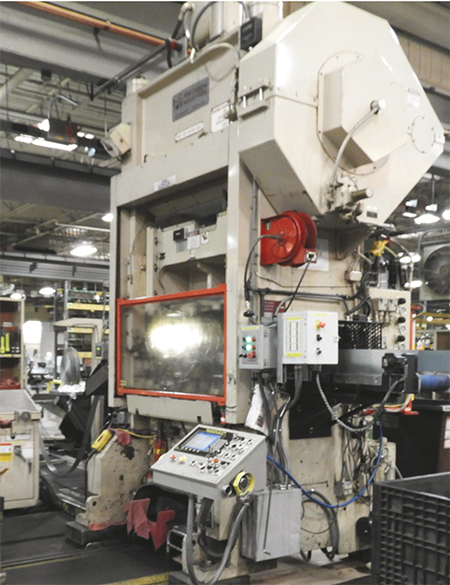 This older press at Greenheck Fan had a control that met safety standards but was lacking in self-diagnostics and powerful user-friendly process-control capabilities. A complete and successful retrofit using the previous generation of Link controls, the OmnLink 5000, led to a succession of improvements in the pressroom. The aging of America is leaving its imprint on the labor force, particularly manufacturing, with boomers born between 1946 and 1964 heading into retirement seemingly en masse. Investopedia.com estimates the number to be about 10,000 daily. The phenomenon could result in 3.4 million manufacturing jobs becoming available through 2025, according to a study by the Manufacturing Institute, a Washington-based think tank, and Deloitte LLC. The study adds that the much publicized skills gap could result in 2 million of those jobs staying unfilled. For metalformers and fabricators looking to stay competitive in coming years, the availability of fewer workers necessitates increased automation via advanced control systems. So where is control technology heading? To help answer that question, MetalForming interviewed decision-makers at TCR Integrated Stamping Systems, a systems integrator in Wisconsin Rapids, WI; Link Systems, a Nashville, TN-based supplier of press-automation controls and monitors; and Greenheck Fan, Schoefield, WI, maker of air-movement and control equipment, including fans, dampers, louvers, kitchen ventilation hoods, and energy-recovery and make-up-air units. Joe D’Acquisto, production supervisor at Greenheck, says that as it becomes more difficult to find employees, the push for greater automation is ramping up. Agreeing with D’Acquisto is Todd Wenzel, owner of TCR. “With fewer people doing more, smarter controls are necessary for companies to remain competitive and profitable,” he says. “As industry needs evolve, so, too, must the controls technology,” adds Lance Curtis, vice president of sales at Link. Over the years, Link has teamed with TCR to provide its OEM customers with the automation necessary for staying competitive. Greenheck is a good example. Founded as a sheetmetal shop by Bob and Bernie Greenheck in 1947, the company has grown steadily as an HVAC innovator with increasing annual sales and market share. Since bringing together its tool and die and stamping operations 20 years ago (tool and die had been outsourced), Greenheck has relied heavily on Link and TCR to address its increasing automation needs. Today, Greenheck’s four stamping presses are equipped with Link press and automation controllers. This provides the OEM with advanced diagnostics; press controls for safety; features such as multiple die-protection channels and programmable limit-switch channels to enhance productivity; and the ability to automate and store production setups and actions formerly performed manually, such as adjusting passline height and shut height, thus enabling consistency, quality and faster cycle times. Link Systems’ ability to provide flexible custom layout solutions allowed Greenheck Fan and TCR Integrated Stamping Systems to create a master operator station (MOS) combining press and feed-interface screens, plus the push buttons to run the system. This MOS, mounted to a movable arm, allows the operator to position controls for greater ease of use. “We’re always looking for ways to improve and reduce setup time,” says D’Acquisto. “Anything we can do to eliminate steps helps. On larger setups, we can reduce setup time by 15 min. 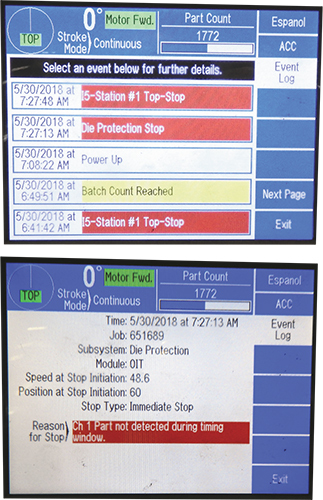 Link System’s 5100 control, available with advanced diagnostics, keeps a running log (several days) of reasons for press stoppages. The information allows for quick identification of faults and machine issues, even by less experienced technicians. Greenheck Fan’s efforts to develop young talent through its ongoing college co-op and internship program has helped gain the Schofield, WI, maker of HVAC equipment a reputation as a stellar workplace for young professionals. Greenheck’s program provides students at four-year colleges or universities with hands-on educational opportunities as they work with experienced product-development, test, application, manufacturing and controls/electrical engineers. Greenheck’s commitment to employee development has earned it recognition as one of Wisconsin’s Top 10 Best Places to Work for Young Professionals. At an awards presentation in May, it received its fourth consecutive Bubbler Award, presented by NEWaukee, a Milwaukee-based organization that focuses on attracting and retaining talent in the state of Wisconsin, and the Wisconsin Economic Development Corp. Award criteria, evaluated by a statewide panel, include competitive compensation and benefit packages, opportunities for advancement, professional development programs, community engagement, and access to leadership. This [award] is a testament to our ongoing efforts and investments to attract, develop and retain employees by creating a workplace environment that supports and encourages employee personal and professional growth through leadership and career development, training opportunities, special events, and wellness programs,” says Kathy Drengler, Greenheck vice president of human resources. Is the controller safety-compliant to OSHA standards? Is it smart? That is, are the diagnostics so primitive that too much time is spent troubleshooting? Are parts available, even for equipment no longer made? Wenzel says Link makes its own parts and, therefore, makes available parts for all its machines, past and present. 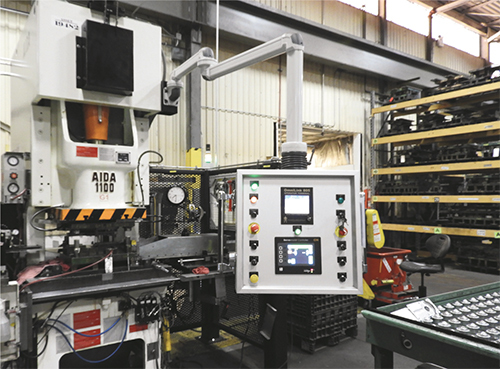 This interconnectivity, seen in Greenheck’s use of the LinkNet communications system for its presses, enables the presses, via automation controllers and tonnage monitors, to report information and status back to the PCs for display, storage and printing. In addition, LinkNet incorporates a preventive-maintenance module for scheduling and generating work-order reports for routine press and die maintenance. As for what lies ahead for controls technology, Greenheck’s Franke and D’Acquisto look forward to incorporating advanced controls systems with robotic forming cells as well as servo presses that feature complex motions. “Greenheck prides itself on using the latest technology when it comes to sheetmetal fabrication, whether it’s stamping presses, press brakes or lasers,” says Franke.